rustic goat cheese, chive, and pancetta tortellini over wilted spinach with brown butter, originally uploaded by aarn! +3rd June, 2010+. made a fresh pasta dough by mixing together 3/4c. all-purpose flour with 1 large egg, 1/4t. salt, 1/2t. olive oil, and 1/4t. luke warm water. placed the mixed and kneaded dough in the refrigerator to chill. mixed together 1.5-oz of fresh goat cheese, one egg yolk, 1T. fresh chopped chives, 1t. panko bread crumbs, 1t. all-purpose flour, salt, pepper, and five thin slices of pancetta cut into narrow ribbons. rolled out the chilled dough and cut it into 4x4-in squares. 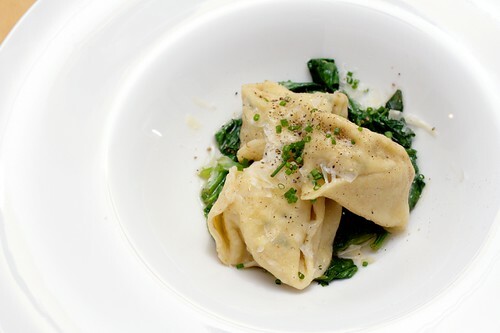 lightly coated each square with a little egg white, folded into a triangle around a ball of the goat cheese mixture, and completed the tortellini shapes. blanched a handful of fresh spinach leaves in a 50/50 mixture of chicken stock and water with a splash of olive oil and a pinch of salt. removed the spinach with a slotted spoon after 30-seconds in the blanching liquid. tossed the blanched spinach in a pinch of salt and pepper and a dash of seasoned rice wine vinegar. cooked the tortellini using the same blanching liquid as the spinach and then pulled and tossed the cooked pasta in 2T. of brown butter. plated the tortellini over the blanched spinach in a warm large rimmed bowl, topped with a splash of the brown butter, salt, pepper, fresh chives, and coarse grated parmesan cheese.